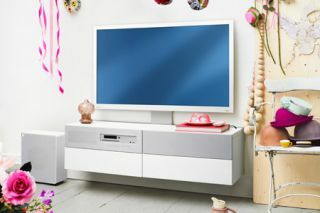 IKEA to launch furniture with integrated TV and Blu-ray systems | What Hi-Fi? We're familiar with flat-packed furniture, but how about flat-packed electronics? IKEA is getting into the home entertainment business, by launching a range of furniture with a built-in smart TV, Blu-ray player and 2.1 sound system including wireless subwoofer. Called Uppleva (which apparently means 'experience), there will be three different designs, in a range of colours, with screen sizes starting at 24in. Each unit will also have space for set-top boxes, games consoles and the like. "This is a large step for us. We will have an offer that is unique in the market," IKEA's living room chief Magnus Bondesson told Reuters. The LED screens are Full HD, have a 400Hz refresh rate, and are equipped with four HDMI inputs, two USB ports and support for DivX HD files, we're told. The electronics – designed specifically for IKEA – will be made by Chinese manufacturer TCL, which sells TVs and other multimedia electronics under the RCA and Thomson brand names. Prices for a complete home entertainment set-up will start at around 6500 Swedish crowns ($960), says IKEA, and the systems will be available in five European cities by June, throughout seven European countries this autumn, but not reaching the UK until early 2013. "We've had very clear signals from our customers that there is a need to be able to buy and integrate home electronics within the furniture in a simple way," says Tolga Oncu, sales chief at IKEA Sweden. The co-operation with TCL isn't IKEA's first venture outside the furniture sector. For a decade, it has sold appliances in conjunction with Whirlpool.